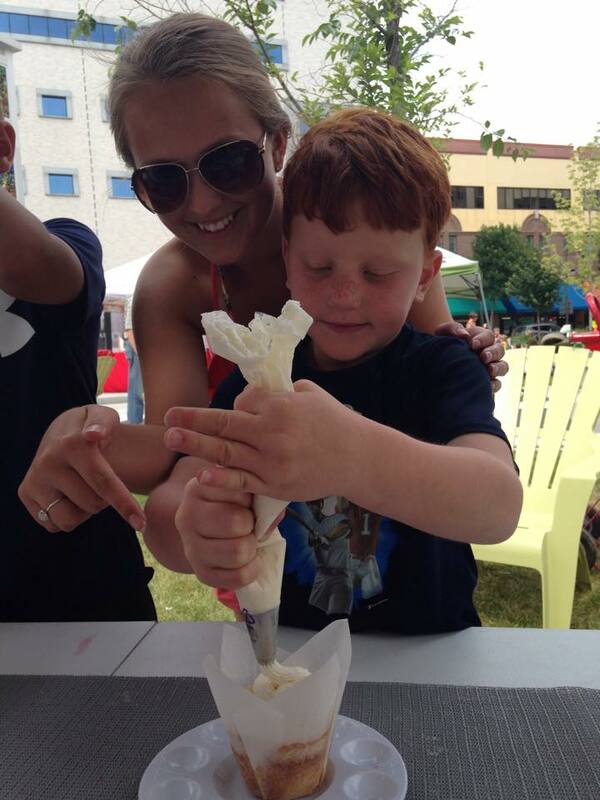 Posted on Jul 6, 2015 by Appleton Downtown Inc.
At the Midweek Farm Market on July 1st, as a part of the ADI intern team, we put on our first Midweek Market Special Feature. Our goal for this summer is to increase the attendance at the Midweek Farm Market by hosting and promoting special events at the market appealing to all ages. For our first event, market goers were able to decorate Fat Girlz Bakin cupcakes free of charge. From 5 to 65, all who participated enjoyed frosting, and eating their Fourth of July themed creations. Not only was this event delicious and fun, but also valuable in that we we were able to work with a downtown business. By doing so, we created a fun, free, interactive booth at the market while also benefiting the Fat Girlz Bakin. Stay tuned on our social media pages for more programming at future Midweek Markets. Events range from henna tattoos to karate tutorials. Be sure to stop by Houdini Plaza every Wednesday for more interactive fun.